On 19th May 1863 celebrations were held at Taradale to commemorate the marriage of Prince Albert Edward, Prince of Wales, eldest son of Victoria and Albert and future King Edward VII, to Princess Alexandra, which had taken place on the 10th March. Arches were erected over the High Street Bridge, lights were displayed outside private homes and the general public enjoyed a 'sumptuous repast' supplied at the expense of the Municipal Council. Hotels provided free drinks, 250 children received 'buns, tea and fruit', and in the evening there was a grand fireworks display and bonfires on surrounding hills. The focus of the day's festivities was provided by a procession of the Municipal Council, Magistrates and Oddfellows who marched with the community to the Public Park accompanied by the Vaughan Brass Band. Here they officially planted two English oaks in honour of the Royal pair. 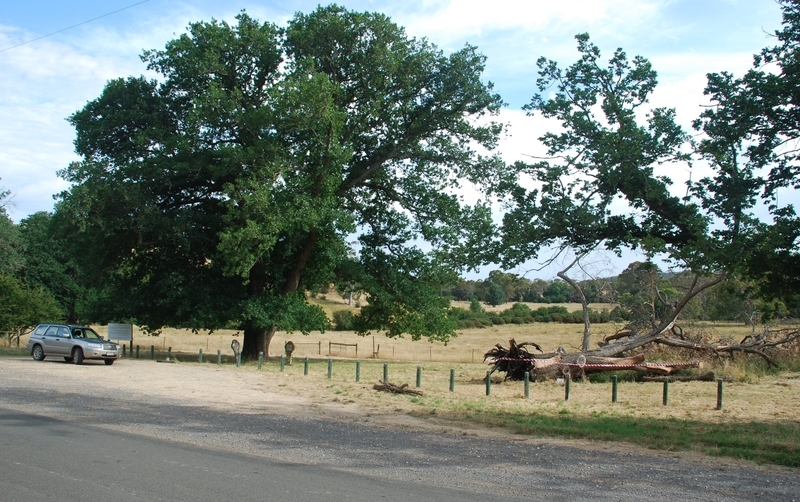 The two Royal Oaks (Quercus robur) at Taradale are of historic and aesthetic significance to the State of Victoria. The two Royal Oaks are historically significant as commemorative trees planted to celebrate the wedding of the Prince of Wales to Princess Alexandra in 1863. Along with other plantings in Castlemaine, Maldon and Daylesford which celebrated the same event, they are important as being among the oldest commemorative oak plantings in Victoria. They are also important as being among the earliest tree specimens which remain to mark the existence of the former Taradale Botanical Gardens, established in the same year. Both the oak trees and the public gardens reflect Taradale's gold rush prosperity and the local community's desire to draw attention, not only to their success and accomplishments, but also to their loyalty. The two trees are of aesthetic significance as outstanding specimens of mature English oaks which contribute significantly to the landscape. 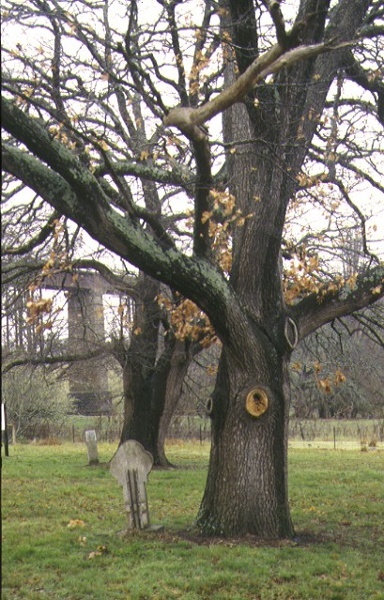 The two trefoil-headed commemorative plaques which stand beside the trunks of the trees are important elements in the significance of the place. Royal Oaks, Taradale Public Park, Metcalfe-Taradale Road, Taradale, Mt Alexander Shire Council. 1. All of the land marked L-1 on Diagram 607970 held by the Executive Director being part of the Taradale Public Park, Crown Reserve Rs 1831 [P131166] and part of the Road Reserve. 2. The two English Oaks (Quercus robur) known as the Royal Oaks marked T-1 and T-2 and the two commemorative plaques marked M-1 and M-2 on Diagram 607970 held by the Executive Director. On 19 May 1863 celebrations were held at Taradale to commemorate the marriage of the country’s future King, Prince Albert Edward the Prince of Wales and eldest son of Victoria and Albert, to Princess Alexandra, which had taken place on the 10 March. Arches were erected over the High Street bridge, lights were displayed outside private homes and the general public enjoyed a ‘sumptuous repast’ supplied at the expense of the Municipal Council. Hotels provided free drinks all day and, at the Taradale hall, 250 children were regaled with ‘buns, tea and fruit’. In the evening there was a grand fireworks display, huge bonfires were lit in the surrounding hills, and the Taradale Amateurs gave two dramatic performances. The focus of the day’s festivities was provided by a procession of the Municipal Council, Magistrates and Oddfellows who marched to the Public Park accompanied by the Vaughan Brass Band. Here they officially planted two English oaks, in honour of the royal pair. The couple were married at St Georges Chapel, Windsor on 10 March 1863 after becoming engaged 9 September 1862. 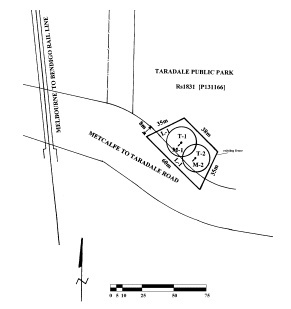 The Taradale Public Park, officially called Barkly Park but more commonly known as the ‘People’s Park’, had originally been part of the Taradale Survey paddock and was occupied by District Surveyor, W. S. Urquhart. In 1858 Urquhart proposed that the paddock be developed as a model farm in connection with the public school. This never eventuated but a year later the area was set aside for public purposes. Urquhart expected residents would use it for ‘promenading’ and recreation but instead it was widely used as free commonage and for mining. In 1861 the land was placed under the control of the Municipal Council for the purposes of a park and garden and public recreation although it was not formally reserved. In July 1863 a departmental surveyor at Taradale wrote that the only improvements that had been effected on the Public Park were the occasional repair of the existing fence and the planting of two small oak trees. A month later a Taradale deputation waited on the Commissioner of Lands and Survey to urge that deeds be prepared to make part of the reserve a Botanical Gardens. The Taradale deputation was told they would have to wait for possession but that they were free to make it into a garden. In 1872 land at the north of the Public park was opened for leasehold under Section 42 of the Land Act and the original Park was sliced in two by a road through to Holywell’s Bridge. The area closest to the township was preserved as a garden. In 1875 trees and shrubs were voted for town reserves including the ‘Public Garden’, and a caretaker and one labourer were appointed to care for the gardens. Trees were ordered (at a cost of £3 - £4) and the present elms and oaks may date from this period. Garden beds appear to have been maintained for a number of years, for in 1879 tenders were called for turning soil in Taradale Gardens and Cricket Ground ‘where the engineer may direct’. If our town had no prospect of growing to be of more importance than it is at present then perhaps the matter would be of little moment but we hold the opinion that Taradale will soon be the scene of bustle and mining enterprise and we will then require our parks which we regard as essential to the town as lungs are to the human body and should be retained by the inhabitants against all opposition.